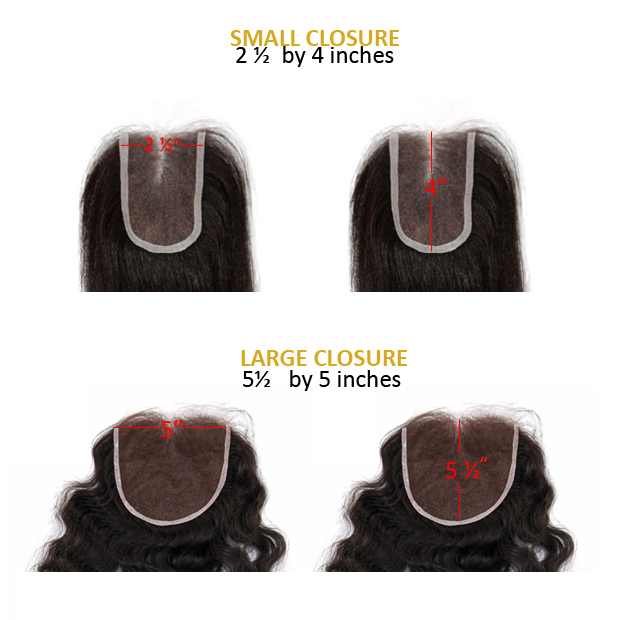 What Size Closure Should You Get? The closures advertised on our site are the reflection of professional installation without the use of bonding glue. Half the battle of getting this flawless natural look is, yes a naturally distributed density, but coupled with a great stylist. So once you purchase your closure, be sure to research around for a stylist that has some experience in closures. The dimensions of the small closure are 2 ½ by 4 inches and the large closure dimensions are 5 ½ by 5 inches. Both of these dimensions are in a horse shoe shape and can be sewn or glued in depending on where you wear your part majority of the time. Make sure to use a measuring tape and measure out the dimensions to EXACTLY where it’ll fall on you. Everyone has different head size so where it’ll cover on your own head will vary. Our closures have the ability for giving a freestyle part and depending on the size you select you will have either a smaller or larger parting range. – If you are not experienced with closures feel free to start off with a small closure as a basic introduction into the world of closures. It will be a less expensive tutorial. – If you are ALWAYS changing the parts in your hair style from a Naomi Campbell sleek straight middle, to a Marilyn Monroe side part then the large closure might give you the variation you are looking for. – If you are suffering from any medical hair conditions a large closure will be suitable to ensure maximum and full coverage. -ANYONE can use a closure. Even if you have long and lustrous healthy hair. Closures are beneficial for helping give the front of your hair some rest from heat/ product damage. Or if you’re going away on vacation and do not want to be bothered with your own hairs maintenance get yourself a closure. -We do not provide frontal closures that measure from ear to ear and we will not be providing these in the future. -Without a great stylist you may risk not being satisfied with your closure. At the moment we do not have any recommendations for stylist in your area but once we put together a stylist network we will let all of you know. -For specific details on each closure or any item we offer, please view the “details” tab of that specific product or our FAQ’s page. Previous Article Can I color my ONYC® Closure? Next Article For many black women, working out or having nice hair is a dilemma. Do you offer closures at a wholesale price. I am just building my clientele and hairline business. If so, can you please send me pictures and a price list. Thank you in advance.